I love to make things. I always have. After high school, I studied fine art at the University of Cape Town, majoring in sculpture in 1999. In my final year, I simply sat in my basement studio and fiddled with off-cut printers card, staples and masking tape. I thus developed a very playful and experimental way of dealing with simple materials and basically found the work process that I still employ today – the process of trial and error. 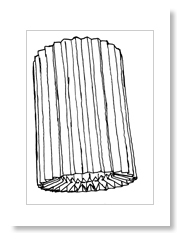 After graduating, I used this work process and the paper-skills I’d developed for myself to earn money, trying out plastic sheets instead of paper and eventually designing a system for making pleated lampshades from folded die-cut panels of polypropylene. A small range of other lights and giftware followed for an art/design store called Bread and Butter, and my business was born (kind of accidentally). These products were designed to be easily produced - alone (in my backyard as such). 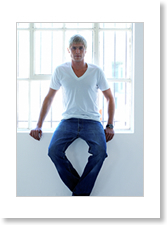 In 2004, having grown the range fairly substantially, I exhibited this work at the inaugural Design Indaba Expo. It was the first time I’d been exposed to an international buying audience, and I was informed that the work didn’t look African or South African enough for their markets’ needs. This led to a very conscious decision to try and figure out what a South African product was, or how to represent my feelings for SA through design. I began to play with our most typical local craft material – galvanised steel wire – and developed the beginnings of a range called ‘strength in numbers’ which was all about the act of binding wire units together to form stronger and more functional wholes. Again, I was making modular structures, and the experience I’d gained making the earlier paper geometric systems was invaluable in this new pursuit. 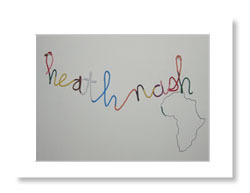 Around the same time, I met a wire artist called Richard Mandongwe. He was selling incredible flowers made from old plastic bottles and wire. The history of re-use as a typical SA mode of production was immediately inspiring. I had found a new voice. By working with Richard, adding his wire skills and an amazing new material (bottle-plastic) to my structural knowledge and play, giving rise to a range of re-purposed post-consumer plastic waste products. I registered my name as my company. Heath Nash was officially reborn (as a brand). By 2005 I had a registered company to run, with a small production team. I was no longer limited to my own 2 hands… and a whole new world of potential was opened up, in the form of totally hand-made products. At first I was revelling in the new freedom that my team offered me. I wanted to play… and I began to need more and more bottles, which my team helped wash - after I’d fetched trailer-loads from a variety of local recycling plants and dumps. We cut loads of leaves, and sent the excess bits back to the recyclers. 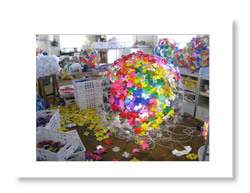 The flowerball followed, and different sizes thereof, and drum-shaped lights instead of only balls… Then I got a big order. For a fabulous international department store. 40 units! In the beginning this was HUGE. We really struggled, and I started to realise there was a need for a different system. The whole drama of bottle collecting, cleaning and cutting hundreds of bottles was too much work for us on top of making the lights. It was difficult to cost accurately, and it was taking more time than it was allowed to – in terms of the expense involved. This meant that we had no time to develop new work, and I was becoming more of a manager than the ‘ideas man’ I was supposed to be. I tried to ally myself with a local environmental organisation/recycling collection point - Footprints. The folks there were trained to wash, cut and crease leaves and flowers. They were to supply me with finished units at set prices. They weren’t as invested in the whole endeavour as us though, and didn’t understand my needs in terms of quantities. Then I tried to train a bigger and more agile team at a local wire-crafting and beading company. It took ages to transfer the designs from my workshop to their systems, and to attain the right quality end-product. All the bottles used here were bought ready-cleaned from Footprints (the above-mentioned recycling centre). The newly trained crafts company was to produce my ranges, and sell them to me as I received orders… This was to enable me and my guys to have more time for custom work and time to develop new products. Good idea, but hard to manage it. Our relationship eventually ended – partly because of the nasty bookkeeping systems involved and partly due to quality control and price issues. However, I also found myself a marvellous personal assistant, Colleen, at this time which really changed everything. Instead of having 500 things to think about and arrange all day, I was allowed to JUST be creative. Colleen also turned out to have recycling connections from a previous job, and there was a magical and relatively easy transition to the system currently in play at my place. This new and workable system is a newly formed company aptly named Poise - which is external to Heath Nash cc – which collects, washes, cuts and creases anything I want. In whatever colour I want. And as many as I want. I don’t have to do any work to find my material of choice, I don’t have to manage the process (collections and washing and all), I can cost each leaf exactly, and a whole new revenue stream opened up for more people than I employ at the studio - Poise. Poise has developed routine weekly collections from many more sorting areas than I previously had access to, and I can easily tap into a relatively steady flow of most colours and shapes on demand. My studio now outsources most of my standard products to trusted individual wire-workers around Cape Town. I buy flowers and make wires, then pass the bits on to these individuals. Again, there’s a spreading of the cash. I have finally become a prototyping and custom workshop.